On June 9th the Government of Nunavut issued a health advisory to the community of Igluliq about a fox that tested positive for rabies – a viral disease which is fatal in animals and almost always fatal in humans once symptoms become apparent – and that one dog had also tested positive, with results on a second dog pending. 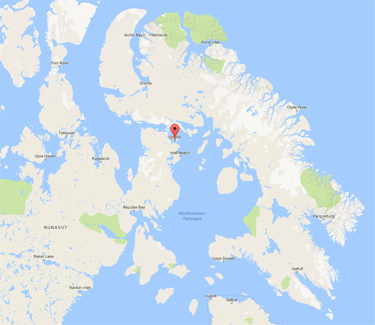 A June 15th Nunatsiaq News article reported that the second dog was positive for rabies, and that results on a third dog were pending. According to Ron Wassink at the Government Nunavut’s Department of Health, vaccination against rabies is not mandatory, but it is encouraged. The Department of Health provides all communities in Nunavut with the rabies vaccine, which is always available upon request and is free. Most communities do not have access to veterinary services, and in those communities, lay vaccinators can administer the vaccine or if there are veterinary services available like in Iqaluit, the veterinarian administers the vaccine. If veterinary services are available then there is a fee unless it is a not-for-profit organization like the Chinook Project where a group of veterinarians travel to a community and volunteer their services, including vaccinations. The Department of Health does not provide parvo or distemper vaccines as those diseases are not contageous to humans as is rabies. After three days travel, on June 15th the Chinook Project, a group of volunteer veterinarians, veterinary students and technicians from the Atlantic Veterinary College at the University of Prince Edward Island arrived in Igluliq for a wellness clinic which had been planned for some time before the current rabies outbreak. The team pretty much had to hit the ground running and get right to work, and saw both dogs and cats daily from at 9 AM each morning well into evenings through June 20th. Aside from treating animals at an indoor clinic set up, team members made “house calls” to vaccinate picketed dog teams. 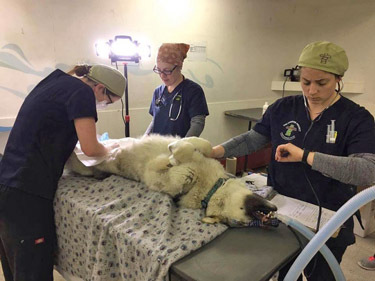 In limited access communities such as those in the Canadian North, the importance of the Chinook Project’s contributions to animal health and welfare, not just for vaccination services, but also a range of veterinary medical/ surgical procedures and educational efforts, cannot be overstated.